The Economic and Financial Crimes Commission (EFCC) has arrested 34 suspected Internet fraudsters at 21, Sawmill Road, Awa-Ijebu, Ogun State. 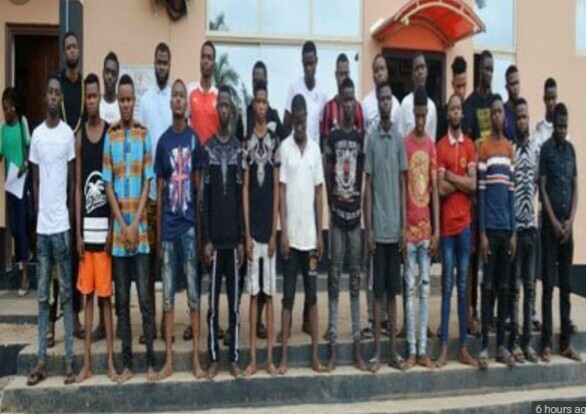 A statement by the EFCC said: “The suspected cyber criminals, who are between 19 and 37 years, include 23 students of the Olabisi Onabanjo University, Ago-Iwoye, Ogun State, nine of who are women, who claimed to be girlfriends and or neighbours of some of the suspects. One of the suspects is from the National Open University of Nigeria and 12 others are non-students. “The commission got wind of their activities through series of intelligence alleging that the suspected fraudsters engaged in fraudulent activities of obtaining money by false pretences through sending emails to unsuspecting victims, mostly in the United States of America. Others were engaged in romance scam on several dating sites. "At the point of arrest, EFCC operatives recovered over 300 SIM cards from them. 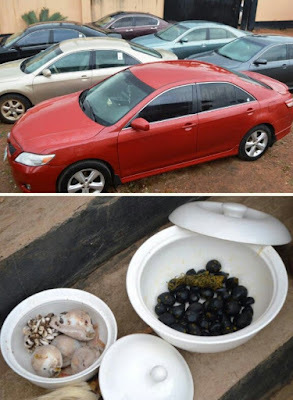 Other items recovered include different models and brands of exotic cars, 18 laptops (nine being of Apple brand), 50 phones (21 iphones) and two bags of fetish objects (juju). Several documents containing false pretences were also recovered from the suspects.